Stella McCartney is one of the hottest brands now, and this contemporary edginess translates well into her eyeglasses collection. 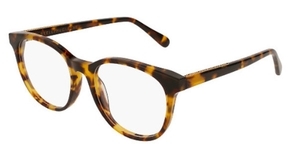 Stella McCartney eyeglasses feature classic shapes like the Wayfarer style, cat eye, round, and panto shapes, but adds her typical flair through color, and sculpted details to make it stand out in a crowd. Passionate about the environment, Stella's keen eye can distinguish between the ordinary and the exceptional. Stella McCarney eyeglasses will get you into that space. Stella Nina McCartney is the daughter of former Beatles member Paul McCartney anAmerican musician, photographer and animal rights activist Linda McCartney.